One year ago, we were in the midst of the endless offseason debate on whether or not the Giants should draft one of the top quarterback prospects or Saquon Barkley. Many – including myself – argued that Barkley was probably a luxury who the Giants could not afford given their extremely rare opportunity to select a potential franchise quarterback at the #2 spot. “It’s a quarterback’s league. You can get a very good running back in later rounds, but not a quarterback. This is a once-in-a-generation chance to nab a stud QB without trading up.” And so on. From the start, Dave Gettleman did not hide his love affair for Barkley. There was no smoke. Some will say Gettleman made the safe pick in selecting Barkley, but I would argue that since most pundits and fans felt the Giants should have selected Sam Darnold, Gettleman was actually sticking his neck out as most would have understood taking the QB. The Barkley vs. Darnold debate won’t be settled for some time. But the early returns are that Gettleman made the right call. With the full understanding that I will be accused of immense hyperbole, Saquon Barkley is the best young running back I’ve watched in my lifetime. At 51, I’m too “young” to have seen Gayle Sayers, Jim Brown, and O.J. Simpson. I saw Walter Payton in the latter stages of his career, not his prime. But I did witness the entire careers of Barry Sanders, Bo Jackson, Eric Dickerson, LaDainian Tomlinson, Emmitt Smith, Marshall Faulk, Thurman Thomas, Adrian Peterson, and others. Based on what I’ve seen so far, I wouldn’t take any of them over Barkley, who combines better size/power base with Sanders-like moves, Jackson-like speed, Faulk’s hands, and without Dickerson’s fumbling. Barkley has it all. He’s a big back who runs like scatback. He can run with power, make you miss, and run away from you. He doesn’t fumble. He catches the football like a wide receiver. He’s a threat to score every time he touches the football. His head is screwed on right. And in the “look at me” era, he just hands the football to the official after he breaks off a 50-yard touchdown. I can’t even imagine how dreadful and unwatchable the 2018 New York Giants would have been without him on the football team. The 22-year old Barkley is already the face of the franchise. Pray he stays healthy and has a long career because this guy truly is a generational talent. The last time the Giants selected a player with the #2 pick was Lawrence Taylor. Barkley has a chance to be viewed in that light. On a bad team, behind a bad offensive line and blocking tight ends, Barkley accrued over 2,000 combined yards and 15 touchdowns. This also despite averaging 16.3 carries and 5.7 receptions per game. Let me emphasize that again, Barkley only touched the ball 22 times per game. In only three games did he have more than 20 rushing attempts. Yet he had over 2,000 combined yards! Amazing. Indeed, one could make a strong argument that Barkley was underutilized, particularly during the first half of the season. Given those numbers, one would normally expect that the Giants’ reserve running backs would have seen a lot of action. First of all, surprisingly, the Giants only had one back-up halfback on the roster in Wayne Gallman. Secondly, Gallman was only on the field 15 percent of the time (as compared to Barkley’s 83 percent of all offensive snaps). Gallman only had 51 carries and 14 receptions all year. That’s an average of only four touches per game. The only other back of note is fullback Elijhaa Penny, who primarily served as a blocker on 12 percent of all offensive snaps. He touched the ball only 15 times all year. In summary, Barkley was THE reason fans watched the New York Giants in 2018. And he clearly is one of the very best players in the entire league. Despite pressure to draft a quarterback, the Giants felt strongly that Saquon Barkley was the best player in the 2018 NFL Draft, selecting him with the #2 overall pick. 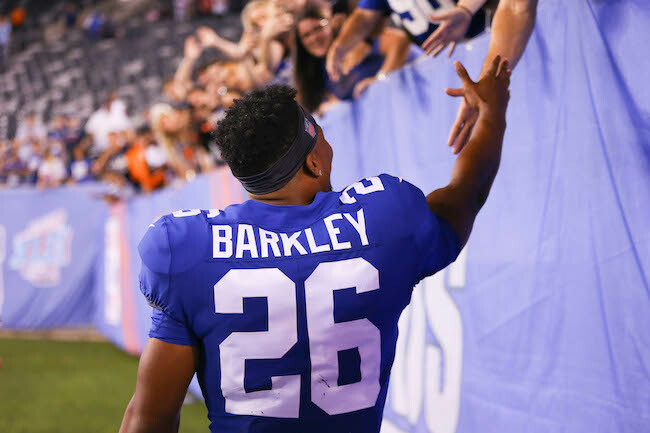 Barkley did not disappoint, becoming only the third rookie in NFL history to accrue 2,000 yards from scrimmage and breaking a number of franchise records. He also was voted to the Pro Bowl and named “Associated Press NFL Offensive Rookie of the Year”, “FedEx Ground NFL Player of the Year”, “Pro Football Writers of America Offensive Rookie of the Year”, and “Pepsi NFL Rookie of the Year.” Barkley started all 16 games, rushing 261 times for 1,307 yards (5.0 yards per carry) and 11 touchdowns. He also caught 91 passes for 721 yards and four touchdowns. Overall, Barkley led the NFL with 2,028 yards from scrimmage. Barkley also led the NFL with seven 40+ yard runs and six 50+ yard runs. The latter figure is the highest single-season total by a Giants player since the 1970 merger. All of this despite playing behind a subpar offensive line. Barkley is a complete three-down back who can make an impact running and catching the football. He has an outstanding combination of size, quickness, and speed. A home-run threat every time he touches the football, Barkley has great vision, instincts, and balance. He makes defenders miss and can accelerate to full speed in a heartbeat. Barkley is big enough to run through and athletic enough to leap over tackle attempts. Barkley is a very good pass receiver who can hurt a defense down the field in the passing game. Outstanding kick returner. He did not fumble the ball in 2018. His biggest negative is that he will sometimes try to do too much and dance around instead of taking what the defense gives him. Excellent intangibles. Team leader with a good work ethic. Despite being the only other true halfback on the roster for the bulk of the season, Wayne Gallman only carried the football 51 times for 176 yards (3.5 yards per carry) and one touchdown. Gallman was drafted in the 4th round of the 2017 NFL Draft by the Giants. As a rookie, Gallman played in 13 games with one start and carried the football 111 times for 476 yards (4.3 yards per carry). Gallman also caught 34 passes for 193 yards in 2017 and 14 passes for 89 yards in 2018. Gallman is a well-rounded cutback runner with good vision, elusiveness, strength, and speed. He has good hands as a receiver, but he needs to improve his ball security (a combined five fumbles in 2017 and 2018). The Giants signed Elijhaa Penny off of the Practice Squad of the Arizona Cardinals in September 2018. He ended up playing in 14 games for the Giants, with three starts, carrying the ball seven times for 25 yards and catching eight passes for 50 yards. The 6’2”, 234-pound Penny was originally signed as an undrafted rookie free agent by the Cardinals after the 2016 NFL Draft. Penny spent his rookie season on the Cardinals’ Practice Squad. He was active all 16 regular-season games in 2017 with no starts and finished the season with 31 carries for 124 yards and two touchdowns. Though Penny lacks classic fullback size, he is a well-rounded player who can block, run, and catch the football. The Giants placed Jonathan Stewart on Injured Reserve in September 2018 with a foot injury. The 5’10”, 240-pound Stewart was drafted in the 1st round of the 2008 NFL Draft by the Panthers. In 10 seasons with the Panthers, Stewart rushed for 7,318 yards and 51 touchdowns. He also caught 162 passes for 1,295 yards and seven touchdowns. In 2017, Stewart started 10 games but saw his rushing totals fall to 680 yards, averaging just 3.4 yards per carry. The Giants signed Stewart in March 2018 after he was cut by the Panthers. He rushed for just 17 yards on six carries for the Giants. Injury prone, Stewart has not played a full season since 2011. 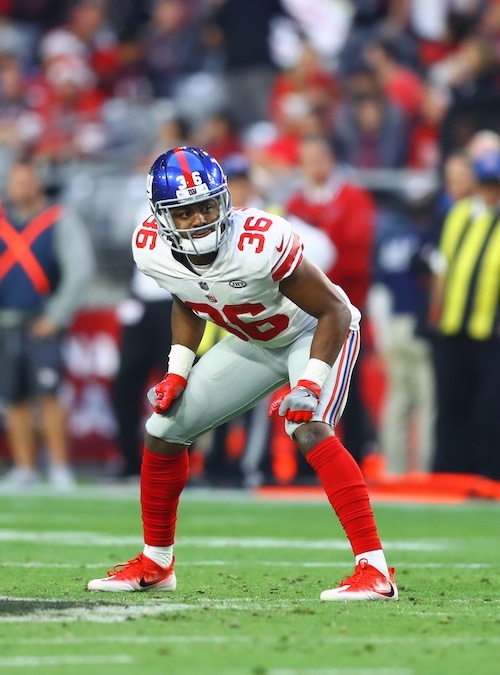 The Giants signed Robert Martin to the Practice Squad in September 2018. The Giants originally signed the 5’11, 210-pound Martin as an undrafted rookie free agent after he impressed at the May 2018 rookie mini-camp as a tryout player. Martin also flashed for the team during the preseason, carrying the ball 15 times for 97 yards (6.5 yards per carry) and one touchdown. Paul Perkins was waived with a non-football injury in May 2018 and placed on Injured Reserve with a torn pectoral muscle that he suffered before the offseason program began. After a respectable rookie season, Perkins had a very disappointing sophomore season in 2017. Perkins saw both his playing time and productivity markedly decline. In 2016, Perkins played in 14 regular-season games with one start. He also started the playoff game. Perkins finished the 2016 regular season with 112 carries for 456 yards (4.1 yards per carry) and 15 catches for 162 yards (10.8 yards per catch). In 2017, Perkins started the first four games, but then suffered a rib injury and lost his starting job to Orleans Darkwa. He played in 11 games and finished the year with 41 carries for 90 yards (2.2 yards per carry). He also caught eight passes for 46 yards. Perkins was drafted by the Giants in the 5th round of the 2016 NFL Draft. Perkins has good vision, quick feet, and cutting ability. He is a tough runner, but his lack of size, strength, and power limits his game. He catches the ball well. Fullback Eli Penny (back), linebacker Alec Ogletree (ribs), cornerback Antonio Hamilton (hip), and free safety Curtis Riley (shoulder) fully practiced on Thursday. Running back Jonathan Stewart, who was placed on Injured Reserve in September with a foot injury, has had his roster status changed to Designated for Return/Return to Practice. Stewart now begins a three-week window (until December 6th) in which the Giants must decide to activate Stewart or keep him on Injured Reserve for the remainder of the season. Because Stewart must sit out a minimum of eight games, he is not eligible to return to the active roster until November 26th. The Giants practice again on Friday in preparation for Sunday’s home game against the Tampa Bay Buccaneers. Not practicing on Friday due to injury were tight end Evan Engram (knee), wide receiver Cody Latimer (knee), running back Jonathan Stewart (foot), and linebacker Olivier Vernon (high ankle sprain). All four players have officially been ruled out of Sunday’s game against the New Orleans Saints. (And Stewart was placed on Injured Reserve – see story below). Nose tackle Damon Harrison (knee), cornerback Eli Apple (groin), cornerback Antonio Hamilton (groin), and wide receiver Stacy Coley (hamstring) practiced on a limited basis. Apple has been ruled out of Sunday’s game. Hamilton and Coley are “questionable” and Harrison is expected to play. Linebacker Connor Barwin (knee) fully practiced and is expected to play on Sunday. The New York Giants have placed running back Jonathan Stewart (foot) on Injured Reserve. Stewart, who signed a 2-year, $6.9 million deal with the Giants this offseason, had gained only 17 yards on six rushing attempts through three games. To fill Stewart’s roster spot, the Giants promoted wide receiver Jawill Davis to the 53-man roster from the Practice Squad. 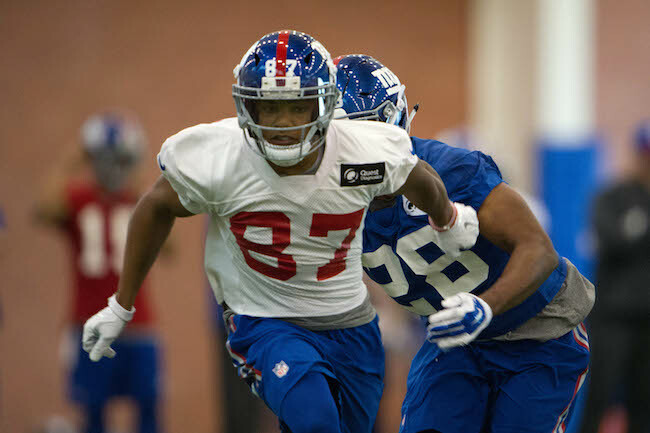 The Giants signed Davis as an undrafted rookie free agent after the 2018 NFL Draft. There is no media availability to the New York Giants on Saturday. The team plays the New Orleans Saints at MetLife Stadium on Sunday. The New York Giants have trade center Brett Jones to the Minnesota Vikings. Newsday and The NFL Network are reporting that the Giants will receive a 7th-round pick in the 2019 NFL Draft as compensation. By trading Jones, the Giants “save” $2.914 million against the 2018 salary cap, the amount of salary (no bonus) Jones was tendered as a restricted free agent. Jones had been playing as the team’s second-team center behind Jon Halapio since the team’s offseason program began. In 2017, Jones took over the starting center spot for 12 games after Weston Richburg was lost for the season. Jones was originally drafted by the CFL Calgary Stampeders in 2013 and named the CFL’s “Most Outstanding Rookie” after that season. Jones was also named the CFL’s “Most Outstanding Offensive Lineman” in 2014. He signed by the Giants in February 2015 and placed on Injured Reserve in September 2015 after spraining the MCL in his knee on the preseason finale. In 2016, Jones was on the active roster for 14 regular-season games and made one start at left guard. Not practicing on Sunday due to injury were tight end Evan Engram (concussion), offensive guard Nick Gates (unknown), defensive end A.J. Francis (unknown), defensive end R.J. McIntosh (unknown), and linebacker Connor Barwin (knee). Linebacker Calvin Munson (concussion) was in a red, non-contact jersey. Engram, despite being in the concussion protocol, did some running on the side. McIntosh participated in some limited football activities on the side for the first time this summer. Running back Saquon Barkley (hamstring), running back Jalen Simmons (concussion), and safety Darian Thompson (hamstring) returned to practice. The transcript of Pat Shurmur’s press conference on Sunday is available in The Corner Forum while the video is available at Giants.com. 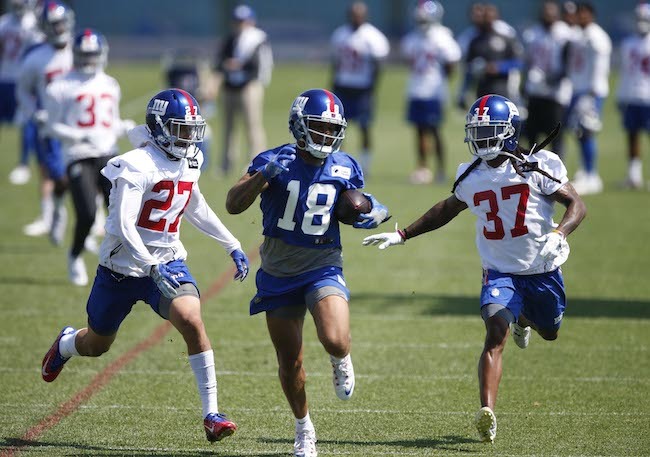 The New York Giants held their third full-team summer training camp practice on Saturday at Quest Diagnostics Training Center in East Rutherford, New Jersey. The complete training camp schedule is available at Giants.com. Not practicing on Saturday were defensive lineman R.J. McIntosh (unknown – Active/Non-Football Illness list), cornerback Sam Beal (out for the season – shoulder), and tight end Garrett Dickerson (hamstring). Wide receiver Odell Beckham, Jr. made one of his trademark one-handed catches in the corner of the end zone. Wide receiver Cody Latimer beat cornerback Eli Apple on a post route for a 40-yard touchdown. Quarterback Davis Webb threw a perfect sideline pass to wide receiver Kalif Raymond for a 35-yard gain. Andrew Adams was the first-team safety along with Landon Collins. 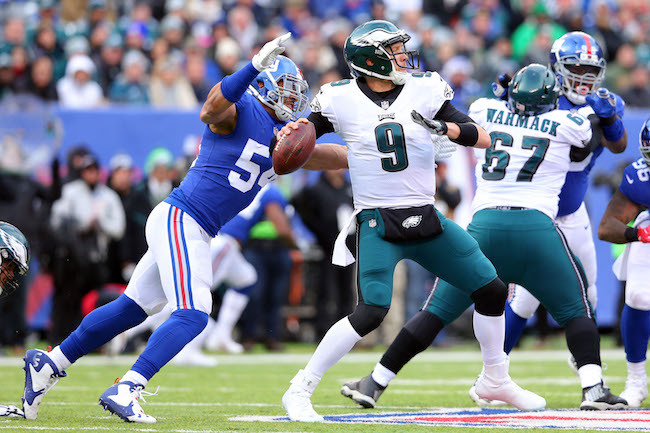 Linebacker Olivier Vernon flashed off of the edge against left tackle Nate Solder for what would have been a sack. Linebacker Kareem Martin beat tight end Evan Engram for what would have been a sack as well. Linebacker Connor Barwin made a tackle for a loss. Barwin and linebacker Lorenzo Carter gave second-team tackles Nick Becton and Chad Wheeler problems. Safety Michael Thomas was untouched on a blitz to “sack” quarterback Davis Webb. Running back Saquon Barkley caught a low swing pass from quarterback Eli Manning and turned it into a nice gain with some nifty moves after the catch. Cornerback Donte Deayon intercepted an underthrown post pass from quarterback Davis Webb, as Webb was being pressured by linebacker Lorenzo Carter. Deayon later broke up another pass. 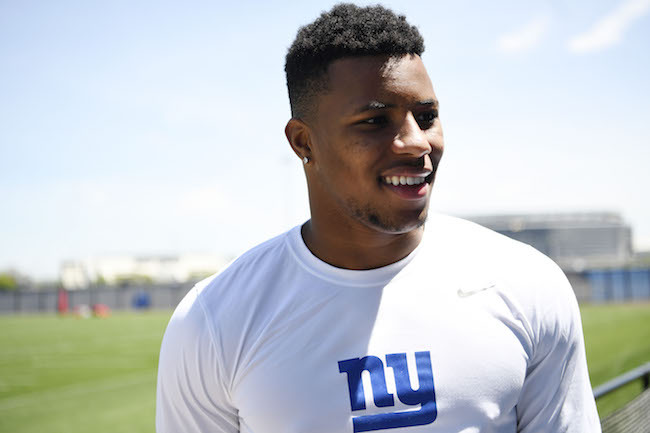 Running back Saquon Barkley caught two touchdown passes during 7-on-7 red zone drills. Wide receiver Odell Beckham, Jr. also had a TD catch during these drills. Defensive end Kerry Wynn received some reps with the first-team nickel defense. Defensive lineman A.J. Francis was consistently disruptive. Linebackers Avery Moss and Romeo Okwara gave the third-team tackles problems. Cornerback Janoris Jenkins usually blankets his opponent, but wide receiver Hunter Sharp got some separation on him twice. Quarterback Kyle Lauletta threw a deep ball to wide receiver Marquis Bundy, who out-fought cornerback Chris Lewis-Harris for the ball. Connor Barwin worked with fellow linebackers Lorenzo Carter, Avery Moss, and Jordan Williams after practice. 2017 YEAR IN REVIEW: The New York Giants have not had a 1,000-yard rusher since Ahmad Bradshaw’s final season with the team in 2012. The Giants’ leading rushers since that time have been Andre Brown, Andre Williams, Rashad Jennings (twice), and Orleans Darkwa. More telling are the overall team rushing stats with the Giants finishing 29th, 23rd, 18th, 29th, and 26th in the NFL from 2013 to 2017. Last season was a continuation of this mediocrity with the Giants averaging 96.8 yards per game and scoring only six rushing touchdowns. There were four games where the Giants didn’t even rush for 50 yards and nine games where the team didn’t reach 100 yards rushing. The overall numbers are a bit inflated too by the meaningless season-finale against the Washington Redskins where the Giants rushed for 260 yards. The Giants’ top four rushers in 2017 were Orleans Darkwa (751 yards, 5 touchdowns), Wayne Gallman (476 yards), Shane Vereen (164 yards), and Paul Perkins (90 yards). The Giants’ sixth rushing touchdown came from Eli Manning. The receiving yards for the backs were from Vereen (253 yards), Gallman (193 yards, 1 touchdown), Darkwa (116 yards), and Perkins (46 yards). Darkwa and Gallman actually were respectable, averaging 4.4 and 4.3 yards per carry respectively. But on a team that finished 21st in overall offensive yardage, 26th in rushing yardage, and 31st in scoring, nothing on offense ever felt like a “strength,” including the running attack. ADDITIONS/SUBTRACTIONS: The Giants decided not to re-sign Orleans Darkwa (who had a plate removed from his leg in May) and Shane Vereen (who also still remains unemployed). Paul Perkins tore his pectoral muscle in the offseason, was waived/injured, and placed on Injured Reserve. Thus the only returning halfback appears to be Wayne Gallman unless the Giants are keeping an eye on Darkwa’s health status. The Giants signed street free Jalen Williams in January, veteran free agent Jonathan Stewart in March after his was cut by the Panthers, and rookie free agent Robert Martin in May. But the biggest offseason move the team made was drafting Saquon Barkley with the #2 pick in the entire 2018 NFL Draft. The Giants have only drafted two running backs in their entire history this high: Tucker Frederickson #1 overall in 1965 and Skippy Minisi with the #2 pick in 1948. Shane Smith is the only returning fullback, though tight end Rhett Ellison can play the position in a pinch. The Giants also added a couple of H-Back types who can play fullback in ex-Viking Kyle Carter and rookie free agent Garrett Dickerson. 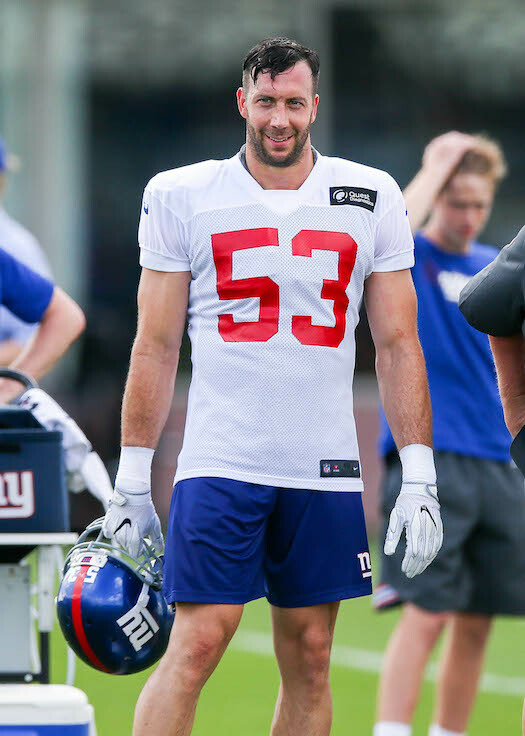 TRAINING CAMP STORY LINES: With General Manager Dave Gettleman throwing around phrases like “gold jacket” and “touched by the hand of God,” needless to say, the expectation level for Barkley has been set incredibly (perhaps unrealistically) high. And while the Giants have had some very good running backs in their history, including Frank Gifford, Tiki Barber, Tuffy Leemans, Rodney Hampton, Joe Morris, Brandon Jacobs, and Ahmad Bradshaw, given the team’s flagship franchise status, one would have to say that the list of top-notch running backs in team history is relatively short and a bit underwhelming. A Giants’ running back has only led the NFL in rushing four times, and that came in 1936, 1943, 1944, and 1951. For the Giants to draft a running back with the #2 pick, and in the process pass over a number of potential “franchise” quarterbacks, Barkley needs to be damn good. No strike that. He needs to be great. It would be a disappointment if Barkley does not immediately become one of the NFL’s best backs and eventually challenge Tiki Barber’s 10,499 career rushing yards and Barber’s 5,183 career receiving yards. The first step in doing that is staying healthy. Running backs get hit more than any other player in the NFL. Barkley is built like a tank, but in order to do the things he needs to do, he must stay on the field. Step two is keeping his head on straight and not letting the immense pressure get to him. That’s easier said than done. All eyes will be on Barkley. Every time he touches the ball, many will expect something special. Barkley readily admits he often tried to do too much on a given play during his career at Penn State. Take what the defense gives you. The big plays will come. In the meantime, eschew the bright lights of the big city and focus on football. The good news is this: Barkley appears to be the real deal. The early returns from the OTAs and mini-camp is he is practically uncoverable by linebackers and even some safeties. At the very least, Barkley should be a major asset in the passing game, provided he can develop a rapport with Eli Manning, a quarterback not known for his screen and swing passes. What will be interesting to see is how effective he will be running the ball. The Giants really haven’t been a top-notch running team since 2008, when the team led the NFL in rushing. 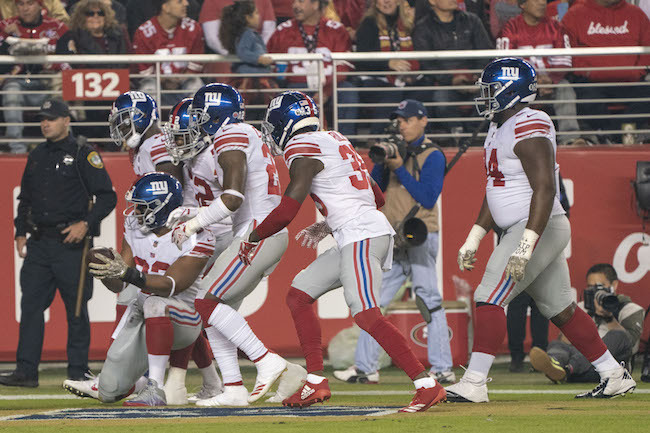 Can the Giants move out of the bottom tier into the upper tier of rushing in just one year? 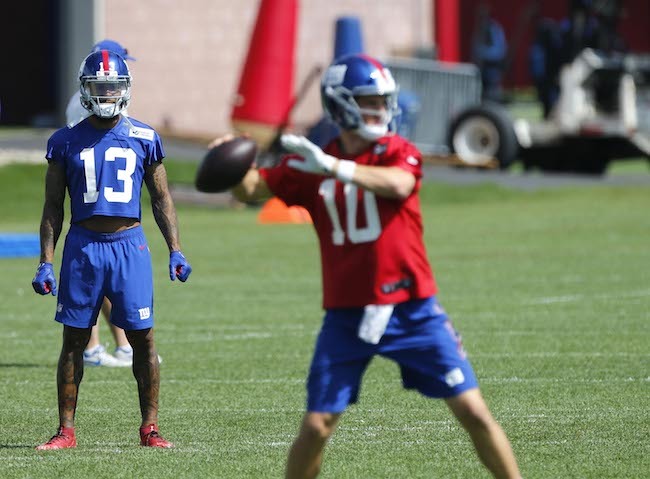 The expectation is that Barkley will finally force teams to respect the Giants’ running game, and thus open things up for Manning, Odell Beckham, Evan Engram, and Sterling Shepard in the passing game. In the last three seasons, the Giants have scored a total of 17 rushing touchdowns, or an average of less than six per season. That needs to change too. Finally, the temptation will be to keep Barkley on the field on every play. The Giants must constantly evaluate his wear-and-tear. They want him to last more than five years in this League. ON THE BUBBLE: The key questions here are how many halfbacks will the Giants keep? And is there a roll for a fullback in Pat Shurmur’s offense? With Barkley likely to receive the overwhelming bulk of the playing time, the Giants may decide to go light at halfback and go with Barkley, Jonathan Stewart (who they paid big money to be a mentor), and Wayne Gallman. The players clearly on the bubble include Jalen Simmons and Robert Martin. It’s anyone’s guess at this stage if Shurmur is leaning towards a roster spot for a fullback like Shane Smith or Kyle Carter. PREDICTIONS: I can’t imagine the amount of pressure that is on the shoulders of Saquon Barkley. There are fans who didn’t want him who will mock him every time he doesn’t break off a big play. Gettleman has Hall of Fame expectations. But there is an aura about this kid. In the age of “look at me,” Barkley seems like an old-school throwback who knows he is good but is more interested in the overall success of the team. Veterans have been impressed with his humility, work ethic, intelligence, and skillset. I think there will be grumblings early from fans, especially since the NFL schedule makers have the Giants opening with the very tough Jacksonville Jaguars defense. But I look for Saquon to get better and better as the season progresses, with his earliest impact coming in the passing game as the new offensive line will take some time to build cohesion. Overall, it’s extremely difficult to see an offense with Odell Beckham, Evan Engram, and Saquon Barkley not being explosive. As long as Eli Manning has some gas left in the tank and the offensive line can become somewhat respectable, then this should be a very fun offense to watch. FINAL DEPTH CHART: Saquon Barkley, Jonathan Stewart, and Wayne Gallman at halfback. Given the fact that the Giants keep adding H-Back types, I think it is safe to say they may keep one as a fullback candidate. I have no idea who that will be however. The Giants held their fourth voluntary organized team activity (OTA) practice on Tuesday. No live contact is permitted during OTAs, but 7-on-7, 9-on-7, and 11-on-11 drills are allowed. The six remaining OTA practices will be held on May 30-31, and June 4-7. There will be media availability for the June 4th practice. A mandatory mini-camp will be held on June 12-14. Wide receiver Odell Beckham, Jr. (recovering from ankle surgery) and cornerback Janoris Jenkins did not attend Tuesday’s OTA. Head Coach Pat Shurmur did say that Beckham was “pretty close” to being cleared to return to practice. Although he was held out of 11-on-11 team drills, safety Landon Collins (recovering from arm surgery) participated in individual and 7-on-7 drills. “(Collins) was out there competing in a limited basis and he’s trying to do everything he can as he finishes up his rehab,” said Shurmur. Defensive lineman R.J. McIntosh (unknown medical issue) and linebacker Avery Moss (unknown injury) did not practice. Place kicker Marshall Koehn was 5-of-7 on field goal attempts, with misses from 41 and 50 yards out. The starting defensive line was Dalvin Tomlinson at right end, Damon Harrison at nose tackle, and B.J. Hill at left end. First-team offensive line combinations included Nate Solder at left tackle, Patrick Omameh at left guard, Brett Jones at center, John Greco at right guard, and Ereck Flowers at right tackle. The Giants also employed Will Hernandez at left guard, Jon Halapio at center, and Patrick Omameh at right guard. John Jerry took reps with second-team at right guard and Chad Wheeler was with the second-team at right tackle. Tight end Evan Engram beat linebacker Kareem Martin deep down the sideline and quarterback Eli Manning hit him with a perfect pass for the touchdown. Cornerback Eli Apple knocked down a pass over the middle intended for wide receiver Cody Latimer. Wide receiver Kalif Raymond made a great catch on a deep pass from quarterback Davis Webb. Tackles Nate Solder, Ereck Flowers, and Chad Wheeler worked together after practice was over. The Giants signed Watson to a reserve/futures contract in January 2018. Watson originally signed as an undrafted rookie free agent with the Cincinnati Bengals after the 2015 NFL Draft. He has spent time with Bengals (2015), Cleveland Browns (2016), Denver Broncos (2016), Philadelphia Eagles (2016), and Pittsburgh Steelers (2017). The Giants signed Severin in August 2017 after he was cut by the Pittsburgh Steelers, waived him before the season started in September, and then re-signed him to the Practice Squad in late December. Severin was originally signed by the Steelers as an undrafted rookie free agent after the 2016 NFL Draft. 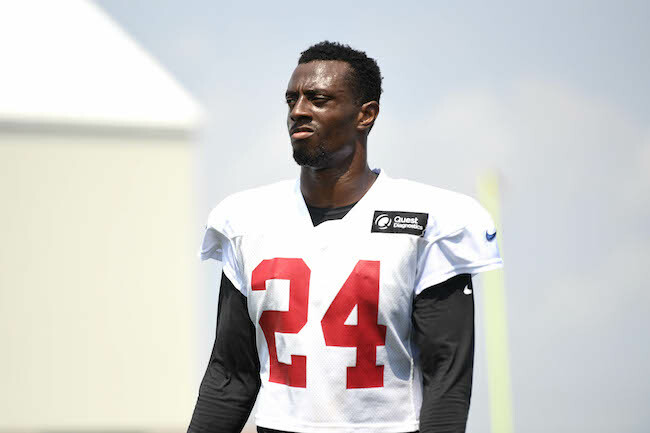 The Giants signed Mama off of the Practice Squad of the Kansas City Chiefs in December 2017. He did not play in a regular-season game. Mama was originally signed as an undrafted rookie free agent by the Chiefs after the 2017 NFL Draft. The Chiefs waived him in their final round of cuts in early September and then signed him to the Practice Squad. Murphy was signed to the Practice Squad in September and the 53-man roster in December 2017. He played in the last three games of the season as a back-up and was credited with just one tackle. Murphy was originally drafted in the 7th round of the 2015 NFL Draft by the Seattle Seahawks. The Seahawks waived him in their final round of cuts in September 2015. He spent time on the Practice Squad of the Denver Broncos in both 2015 and 2016. The Giants signed Murphy to the Practice Squad in late December 2016. The Giants signed Rehkow to a reserve/futures contract in January 2018. Rehkow was signed by the Buffalo Bills as an undrafted rookie free agent after the 2017 NFL Draft. The Bills waived him in August that year.